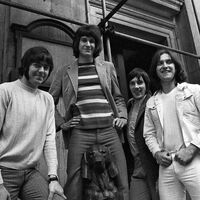 The Kinks were an English rock band from London, formed in 1964 by Ray and Dave Davies. Joined by Peter Quaife and Mick Avory, the band was categorised in the United States as a British Invasion group, and operating within this genre established themselves as one of the most influential and successful bands of the era. Their music was influenced by a number of different genres, including country, folk, and rhythm and blues. In the band's 32 year history, the brothers Ray and Dave Davies were the only permanent members. Avory left in 1984, being replaced on the drums by Bob Henrit. John Dalton joined after Quaife's departure in 1969, later leaving and being substituted by Jim Rodford. In addition, they were supported by a number of accomplished keyboardists, namely Nicky Hopkins, John Gosling and Ian Gibbons. The band came to fame with their third single You Really Got Me, topping the chart in the UK and reaching the Top 10 in the United States. This single is widely regarded as the first hard rock hit, and consequently became the blueprint for a number of future genres, including heavy metal. Following particularly rowdy performances in the US, the band was banned from performing in the America by the American Federation of Musicians, effectively cutting them off from their primary market at the height of the British Invasion culture. The Kinks released a series of commercial successes between the mid 1960s and 1970s, but their subsequent theatrical concept albums achieved less critical acclaim. The band finally split in 1996 following creative tensions between members and a decline in album sales however, Ray Davies successfully continues to record and perform a a solo artist.